The Sheriff’s Daughter. Sometimes the smallest things we can do for our neighborhoods can have the biggest impact. Laura is the only daughter of the local sheriff. As an official in a county her father is responsible for keeping the peace and enforcing the law. But recently he has been facing some troubles which made him very worried. Laura will find out that her father lately has a problem keeping the residents in his county because they are constantly moving out. She scoured towns around the county and found a little neglected town and decided to explore it in order to solve the cause why the inhabitants had left. She wonders whether the movement of people to another destination was to settle or reside there, especially as permanent residents or naturalized citizens, or to take up employment as a migrant worker or temporarily as a foreign worker. Laura finds out that the site on which the town was built belonged to the local indigenous population. From Machu Picchu to hulking castles, we have all heard of famous ancient ruins. Her new adventure leads you through a perspective on history. It seems the inhabitants there have the same problems as the last ones their buildings look different than usual. She is determined to do everything in her power to calm both sides and build new housing for expatriate residents. Help Laura with your tiny ways to make outsized transformations. 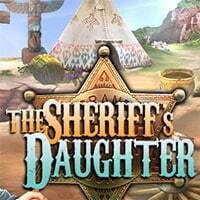 Enjoy and have fun in playing The Sheriff’s Daughter Game.